Sky learning to herd in a small pen. 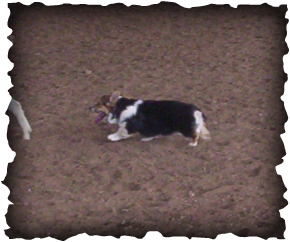 More than Border Collies are welcome to come learn to herd. Bonding is a sound way to help your dog know who is boss and who is the dog. Note: it is easy to treat your pup like a human this adds to confusion with some dogs having trouble telling the difference between the human boss and who is to be the well behaved dog. Teaching your dog to respond to their name then to come when called is key to a good start. We strongly believe in crate training your dog. We have used it to house train, pre-kennel training for puppies and young dogs, a reward location where they get treats, and a good place to stay when things get crazy, and a safe place where all others leave them be when they need time away. Bonding moments take it where you can get it. Sleep is not over rated when you are a puppy. Well I am here. I like the attention. Can we do it again? Well can we? Teaching recall is not hard yet it takes practice, practice, practice so give yourself time to practice with your dog. The bonding, then the recall are key to calling your dog off livestock in case the dog gets in over it's head in the learning process, needing to be recalled or adjusted. Note the training tool of the rope under the boot being held down by the soul of the foot thus holding the rope in place. Laying down is my only option may as well look like it is what I planned on doing. 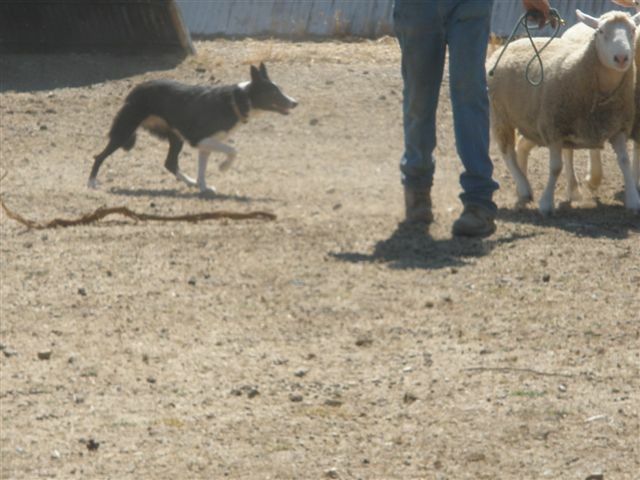 I am eager to get on to the better things sometimes learning the basics seems boring but I will do it so I can work livestock because that is my goal in life as a herding dog. Zoe is connected to the fence while we practice her lay downs with me moving greater and greater distances from her. Now to train with her moving away as the trainer stays in one location. Note : I will have a lightweight rope attached to her collar to help keep her under control first then I will start work with her off the rope. 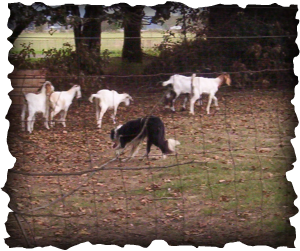 The livestock wants to stay close to their people as they know the dogs are not as friendly. As one walks backward call out to the dog to walk up. Lots of encouragement is needed for some dogs other dogs catch on quick. Walk backwards calling the dog if you need to as it circles the livestock or weaves behind the livestock. There may not always be a lay down but more of a stop there command. As Diamond Dot is doing in this picture. There is a another way of saying lay-down in how we use it. There means stop right there. With this command on the dog I can then give the dog the next command and it can hear me, the command can be come by, away, or walk up, etc. There works for us better than just a lay-down. It is another command that others often do not put on their dogs, but we have found it useful compared with just having lay-down on the dog. Thus we have there meaning stop/listen. Lay-down meaning wait, low to the ground, no more push for the livestock, let there be a space aka livestock see or feel less pressure from your presents. There gives the dog a way to stop while still being in an upright position. The way we put there on the dog is in pen work. While the dog is going around the livestock we use a pole, electric fence post, 5-7 foot long piece of lightweight pipe, brought down just in front of the dog causing it to slow down, turn the other way. There stops the dog so it can hear the next command. Often needed when working unsure dogs or dogs whom are intense. There is not for everyone but we do find it useful in our training and trialing. Diamond Dot 3 months later with the there command on her after doing a walk up. Dan was taking her into the goats but wanted Dot to hold them There not letting them pass, more along the lines of a stay there at this point. She is waiting for her next command. 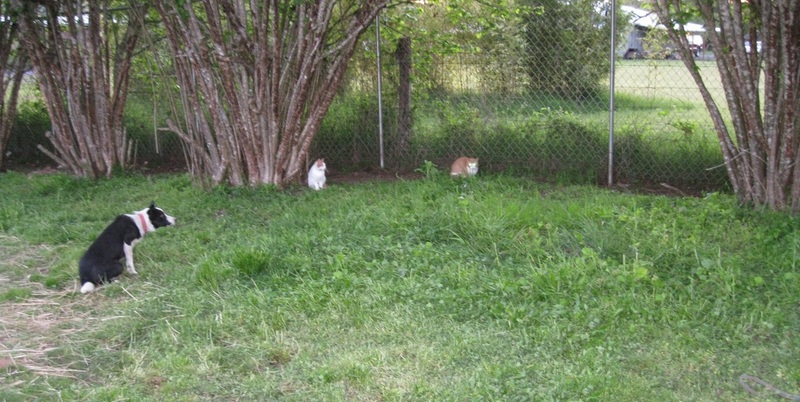 Notice the cats out in the pen being used as a distraction. 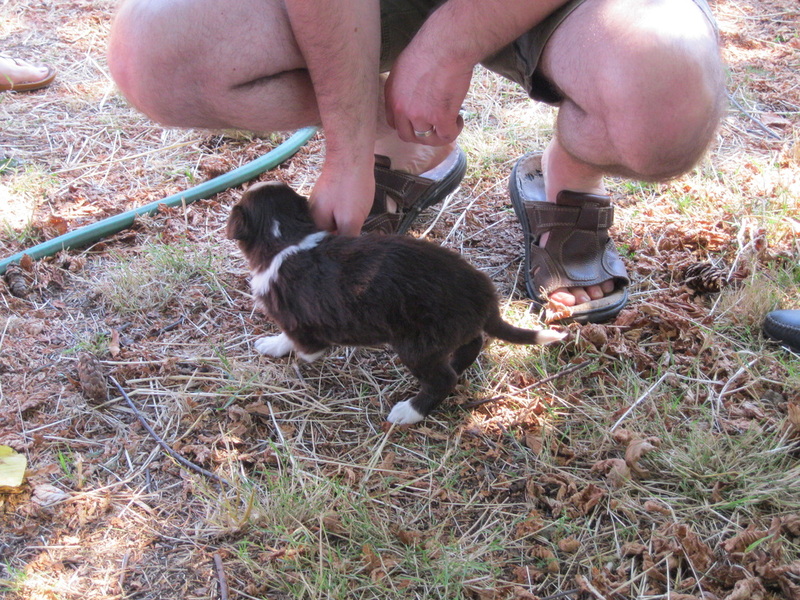 Dot has passed in flying colors learning to keep her eyes on the livestock while those pesty cats try to distract Dot. Border Collies most I have had do not need or want a treat of food after working livestock. The work itself is the reward. You be good you work, you be bad you say home until you forget some of the junk you are trying to do out there with the livestock. Then we will once again put you back on the training leash until you stop that behavior you dog you. 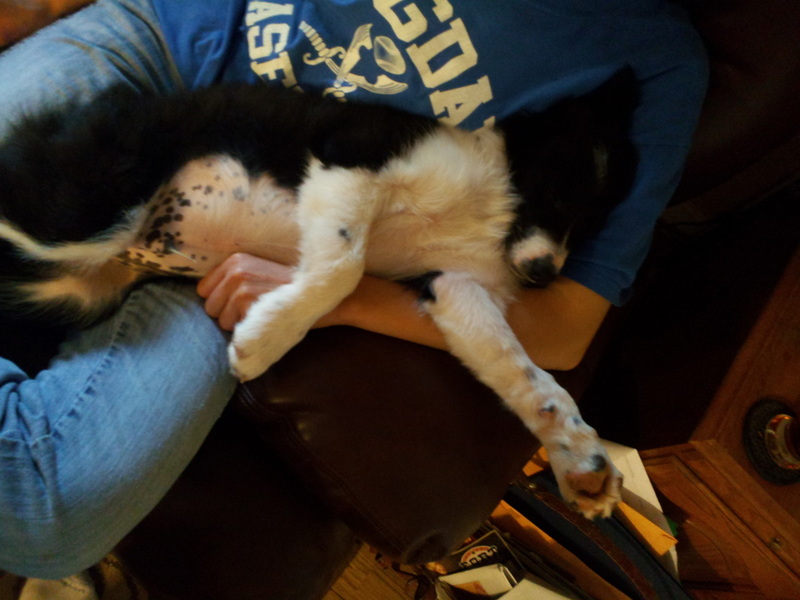 Border Collies understand many things much like a 5 year old child therefore keep it simple, kept it easy, kept doing it until we get it right then do it again just to be sure I understand it as well as you hoped your dog did.